This week Lawn Fawn is teaming up with Thermoweb to bring you some fab projects. Big thanks to Thermoweb for all the adhesive goodies! Here is my card for today. 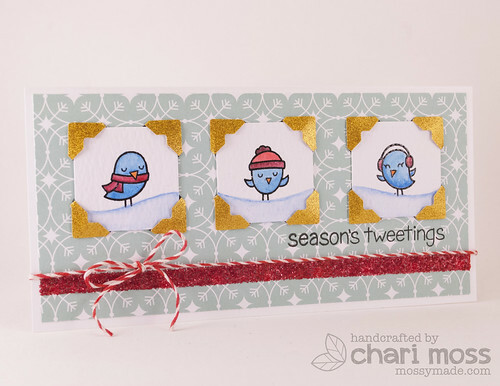 I used the Thermoweb Glitter Dust Gold photo corners for each of my little bird panels. I also used the Thermoweb 1/4"icraft adhesive tape for the band of glitter and I used the Thermoweb Sticky Tab Runner to adhere my patter paper panel to my card base. The little panels are cut from watercolor paper and I colored them with watercolor pencils. Be sure to visit the Lawn Fawn Blog and Thermoweb for more projects all week long. Love the little snow hills the birds are on and those gold photo corners go so well with your picture panels. Absolutely adorable!